That’s what Kimberley Buffington says about the transformation that led her to start a non-profit and in turn a for-profit urban farm. 12 years ago, while working in the pastorate of a suburban church, she began to wonder why they were doing mission-work in South America, but nothing closer to home. Through a friend who worked at Trader Joes, she began picking up donated food from one of its stores each week. Over a decade later, Buffington and those she works with make these pickups daily and provide fresh produce to around 400 Detroit families every week as part of the program Eden Gives. She eventually realized, however, that just providing food wasn’t solving the underlying problem of food insecurity. The economics of the city still made it hard for many Detroiters to travel to good markets or afford the food sold there. Being dependent on the largesse of big companies or out-of-state farms wasn’t exactly a path to food security either. 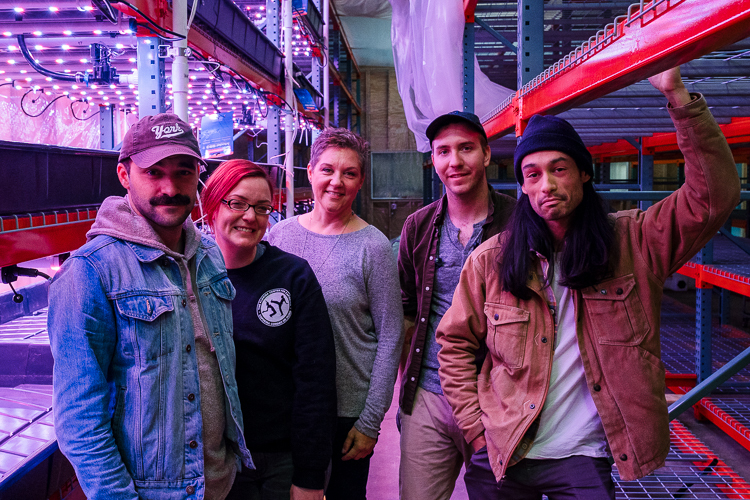 But instead of a traditional soil farm, Buffington started Planted, a hydroponic farm on Detroit’s east side that will focus on growing for local restaurants, institutions like universities and hospitals, and meal-kit companies like Hello Fresh and Blue Apron. For chefs or companies looking to acquire specific items, Buffington says, “we can scale growing systems just to grow that product.” Perhaps her biggest selling point, however, is producing a number of things locally like herbs and greens that are normally brought in from California and Mexico, especially in the winter months. This would cut down on transport costs and deliver a fresher product. Buffington received funding and support from Michigan Women Forward (MIWF), an organization looking to change the investment ecosystem by making loans to women and other underserved individuals. MIWF has provided loans to a number of other farms and food businesses in Detroit, but this was the first time they had funded a hydroponic operation, which is a system for growing crops that uses soil-less media like gravel or rock-wool to grow plants in a solution of nutrients dissolved in water. Growers have the ability to control most of the factors that go into producing food, allowing them to grow plants more quickly and with a minimum of pressure from pests and disease. Hydroponics doesn’t offer some of the ecological advantages of organic outdoor-growing such as potential carbon sequestration and habitat for wildlife. But advocates say that it can greatly reduce water demands and that as more efficient lighting and solar arrays come online they will be able reduce the energy needed to light and heat controlled-environments. 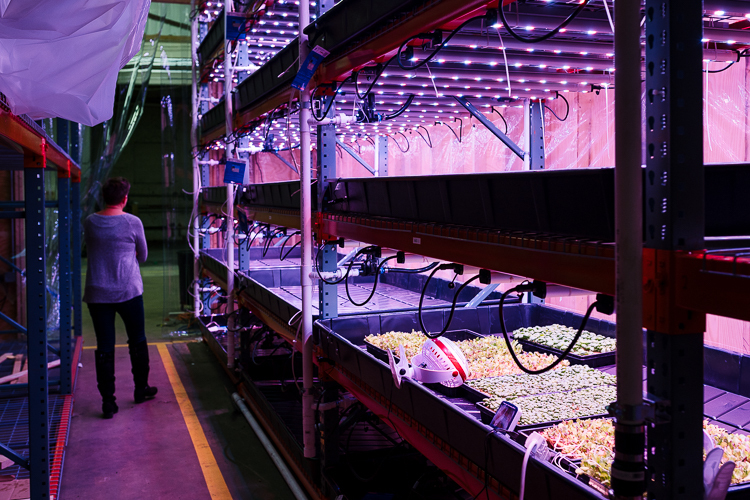 Planted’s initial 6,000-square-foot production space is filled with heavy duty shelving for holding lights and hydroponic growing trays. Five of these shelves rise up to a ceiling that is sealed-off from the rest of the space to control temperature and humidity. The goal is to fill the 20,000-square-foot building within three to five years and then move to a larger building that they will construct themselves. While developments in the cannabis industry have increased the efficiency of lighting, energy will remain one of the major costs for a business of this kind. Buffington believes that constructing their own building, with attendant geothermal climate-control and solar panels, will help insure long term sustainability. PACE credits or incentives offered by the Department of Energy could help subsidize the costs. One area of the warehouse that has twenty-two-foot-high ceilings is being set aside for a robotic growing system. Buffington describes it as sort of conveyor belt that moves trays up and down so growers can work the trays. Robots or no, Planted will need workers. They currently employ eight people in full- and part-time positions. One of those Buffington has brought on board is local grocer Meg Burritt who previously worked with Blue Apron and other grocers. She sees the potential to shorten the distance food travels from farm to plate, which could increase quality and decrease waste. This could also help chefs access local produce in the off-season when most farmers are limited to hoop-house production. 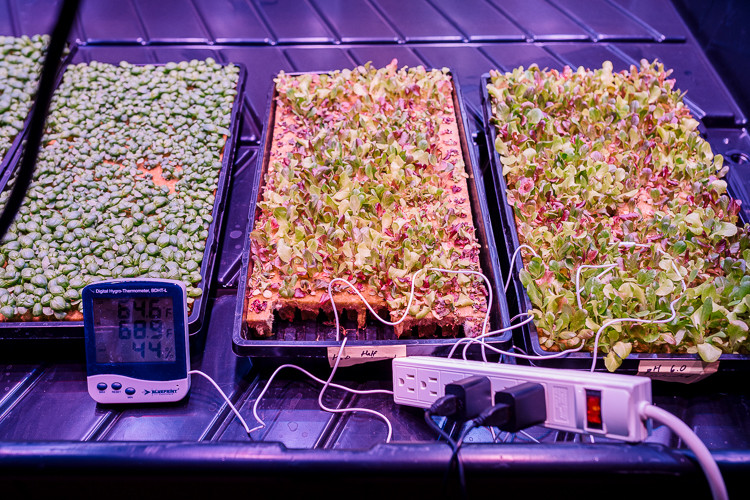 Affordability could be an issue for some Detroiters since hydroponic foods are often more expensive than their field grown counterparts. But that’s why Buffington will maintain the nonprofit arm of her business. “As our business becomes profitable we’ll be able to donate products weekly to Eden Gives that will go out into the community,” she says. This article is part of “Detroit Innovation,” a series highlighting community-led projects that are improving the vitality of neighborhoods in Detroit, while recognizing the potential of residents to work with partners to solve the most pressing challenges facing their communities. The series is supported by the New Economy Initiative, a project of the Community Foundation for Southeast Michigan that’s working to create an inclusive, innovative regional culture.